Here is a Father's Day cryptolist puzzle to support most literacy programs in middle grades 5,6,7,8 classrooms and home schooling environments. 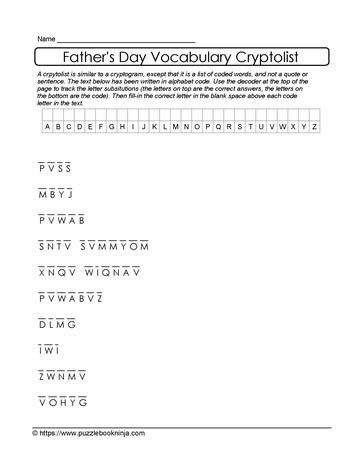 Knowledge of letter patterns in words, word patterns in expressions, and words connected with the Father's Day theme support decryption of this cryptolist. Father's Day words have been encrypted with an alphabet code. Puzzle solvers must decipher the code. Record the letter substitutions in the chart at the top of the page. This puzzle engages the brain as it looks for connections between and among Father's Day words, the encrypted list and the possible letter substitutions.